All orders have absolutely FREE SHIPPING?! Yes, we are serious! All orders will be processed within 3 business days. Orders are typically processed quicker than our estimations, but we like to give ourself a little wiggle room. Orders will ship via USPS First Class Mail. Once the package has left our facility, there is a 3-7 business day estimated arrival time. While the orders largely arrive within 3-4 days of ordering, we cannot make guarantees on the speed in which USPS delivers them. We are not responsible for items delayed by USPS. Please note delivery times do not include Sundays or holidays. What if I need my order sooner than this? Not a problem! You can upgrade your shipping option to USPS Priority Mail. We recommend upgrading to priority mail, as this shipping method includes insurance. For $5.95 dollars you can expect your package to arrive within 2-4 business days and have insurance in the rare event your package is misplaced by USPS or stolen. Adeline Clothing is not responsible for items lost in transit or stolen. Once your order has been placed, you will receive a confirmation email. Once your order has been shipped, you will receive another email with a tracking number. 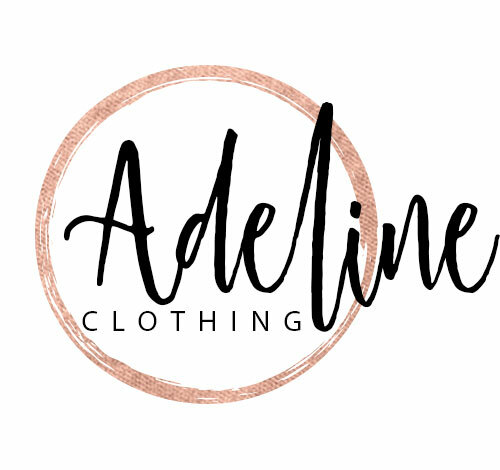 You can check the status of your order at any time by logging onto your Adeline Clothing account or by tracking your number usps.com. We also offer live updates on your order via Facebook Messenger.